JBRC podium finisher Josh McErlean returns to the British Rally Championship and has made a switch from a Ford Fiesta R2T to a Peugeot 208 R2 for the new season. McErlean took a breakthrough podium on the Ypres Rally last year and showed front running pace on the Ulster Rally last season in a MH Motorsport run Ford Fiesta R2T. 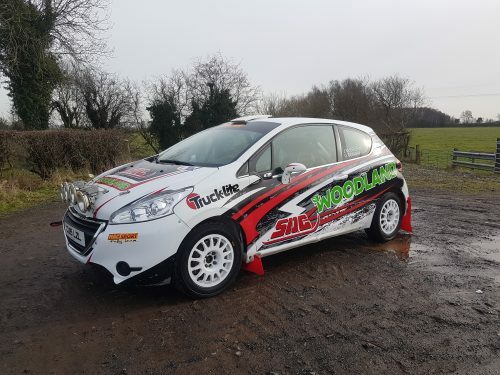 For 2019 Josh has swapped camps and will run a Peugeot 208 R2 – arguably the front running car in the series. As well as a new car, the Northern Irishman will be joined by Ger Conway in the co-drivers seat. Conway is no stranger to the JBRC as he helped guide Robert Duggan to the title in 2016. “Obviously its great to be back in the BRC. There is no other place that offers us so much competition and the type of stages for a reasonable budget. After the pace we showed last year it was a no brainer to get signed-up and get plans together early and I would like to thank my sponsors, especially Woodland NI for getting me here. “We did the first round of the Irish Forestry and won the Juniors so hopefully the form continues into the BRC. The big difference is not having a turbo which I think makes it easier to drive. It’s like a bigger version of the Citroen C2 I drove a few years ago so quite comfortable already with the car.